Spring is upon us here at Mountain Lamp. This morning, there were so many new birds singing. At night the owls are thrumming for mates, and in the early morning, the woodpeckers are finding loud surfaces (like the metal roofs here) to make their presence known through the whole valley. We just ordered our garden seeds. On March 7th, we will have a work day for pruning the orchard and a bonfire with s’mores. We hope you can join us. Mountain Lamp is looking to fill some positions. Click here for more information. Here are two New Year’s Gathas from Thich Nhat Hanh. 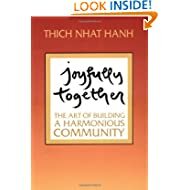 Last night (Monday, July 22) we started reading together the book ‘Joyfully Together’ by Thich Nhat Hanh. We plan on reading and learning from this book during Dharma discussions for a while. If you would like to learn more, here is a link to the book on Amazon.ca. Coming soon… The WIld Rose Sangha will be following the Fall Practice Period 2011 by Eileen Kiera (of Mountain Lamp Community). Stay tuned for more details as they unfold. The book that we will be studying is: “For a Future to Be Possible: Buddhist Ethics for Everyday Life, Thich Nhat Hanh“. We invite local and distant Sanghas to join us for six weeks beginning with a Day of Mindfulness on September 18th, and ending with a non- residential retreat from October 28th – 30th at Dharma Gate (formerly the Seattle Practice Center). Dharma talks will be given on September 19th, October 4th, 17th, and 31st as well as during the Day of Mindfulness and non-residential retreat.